Bethany: Driving from the airport and seeing Kolkata for the first time it was difficult to take in, but trying to do so was quite exciting. Everything is so different. Walking around the level of poverty really hits you which is tough and the colours, noises and smells are totally overwhelming. Luke: Kolkata is a huge jumble of sounds, smells and clashing colours. Car horns are an integral part of a vehicle and form a constant and ignored wave of noise. Every different street smell hits you with a new smell whether food or something else and everything is decorated to draw your eye, often in the case of buses with ‘obey the rules of the road’ which the buses seem to ignore as much as anyone else. The biggest jumble is the frequent clash of a sleek and shiny shop or hotel next to a ruined building full of people, or surrounded by street vendors or those living on the street. Everything here happens in a little space – even the lives of the rich and the poor. Stefano: Kolkata is a city where everything is quite ridiculous, and chaotic. Walking round some of the streets today, the poverty was, of course, blindingly obvious and very shocking when you think about the extent of it. There were people making money in every way possible, and yet there was something very calm about them all. Daryl: Soooo, what can I say about Kolkata? A sensory overload, a mumble jumble of everything you could imagine. It is truly fabulous, yet simultaneously brings a deep sadness to my heart; I thought I would be able to prep myself for the level of poverty here, yet it’s not what I quite imagined. Part of me thinks, should I be here? A privileged, westernised global citizen. The rest of me thinks this will be a great experience and I’m sure there are many adventures to come! Hannah: In Kolkata there is a constant rush of numerous people going about their lives – the streets are colourful, noisy and chaotic. It seems strange and sad to think that the obvious poverty here is normal for many of the people of Kolkata and they would find my western lifestyle just as foreign as I find theirs. Ella: It’s loud, but I must admit I was imagining a huge array of sounds, traffic, people talking and all the vendor; when in reality it was just the car horns non-stop. Very easy to get used to. My very first thought, as I was looking out of the plane window was the very beauty of the city. Bright, colourful buildings emerging out of the lush green surrounding everything. I am looking forward to exploring the beauty of Kolkata, even today as we walked around some of the back streets I could see the beauty of the buildings and of the people, some smiling, some staring and all amazing. Helena: There are so many colours and sounds and people. It’s busy and humid and just plain crazy but I really like it here. On our walk around the streets today there was so much to take in, ‘twas a totally different experience to anything that I have seen before. We saw poverty and random animals and some weird smells, but people were happy. 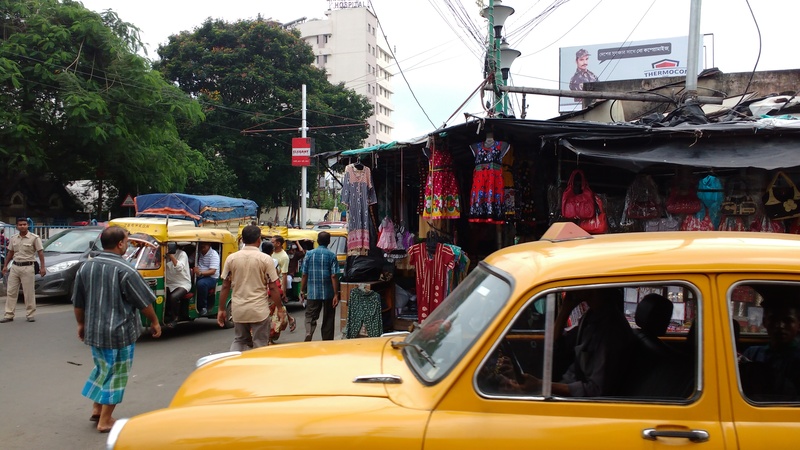 Josie: Kolkata is a brightly coloured city – coloured buildings, yellow taxis, vibrant fruit stalls. And I noticed there were lots of animals living on the streets. But the thing that stood out most was the organised chaos of the traffic. The vehicles on the road have no order to them and seem to drive all over the place but they never crash. Thankfully no of us got run over in the crazy traffic! That’s it from us for now. Over and out from a very tired team hoping to get a good night’s sleep before a busy day at one of the street schools tomorrow.